Herringbone stitch is a popular basic bead-weaving technique. The stitch has strong links to traditional African beadwork, so you may sometimes find it called Ndbele stitch, after the tribal region where it is most commonly used. If you have ever had the pleasure of looking at familiar to you. 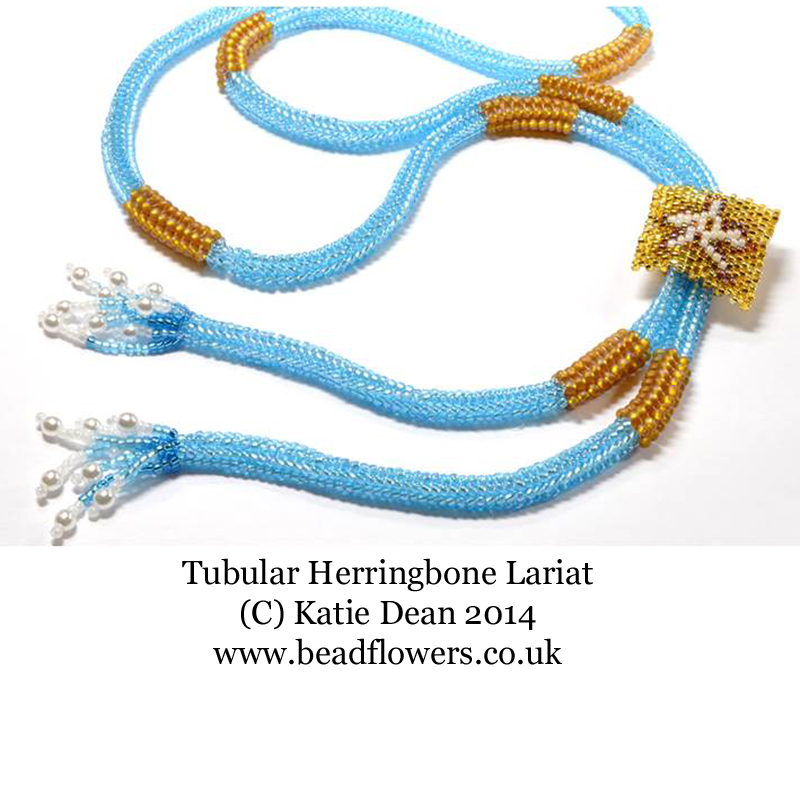 If you are already familiar with other crafts, then you will know exactly what I mean when I say the beads sit in a conventional herringbone style arrangement, hence the Westernised name for the stitch. The African version is traditionally made using bold, often primary, colours and striking geometric patterns. As you can see from the photo to the left, the westernised version of herringbone stitch can be used to create any pattern, in any colour. The sample shows flat herringbone stitch. This is worked in columns, so although the basic variation makes rows that are one bead high, like brick stitch, herringbone stitch can be stacked. There are two different methods for starting herringbone stitch: the ladder stitch start, which involves creating a single (or I find it easier to use a double) bead row, like the base used for brick stitch. Or, there is a more complicated starting pattern that creates the first couple of rows at once. Whichever start you prefer, the remaining rows are then worked back and forth along the beadwork. 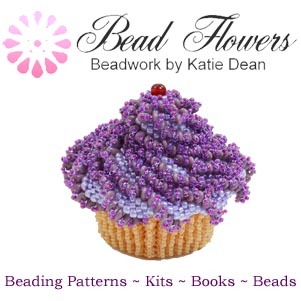 Picking up two beads, you pass down through a bead from the previous row and up through the neighbouring bead, so you are constantly adding stacks on top of you work. This leaves the end rows with a frilly looking edge, as you can see in the photo above. There are various ways of tidying this, including using it as a base for interesting edging like picots. 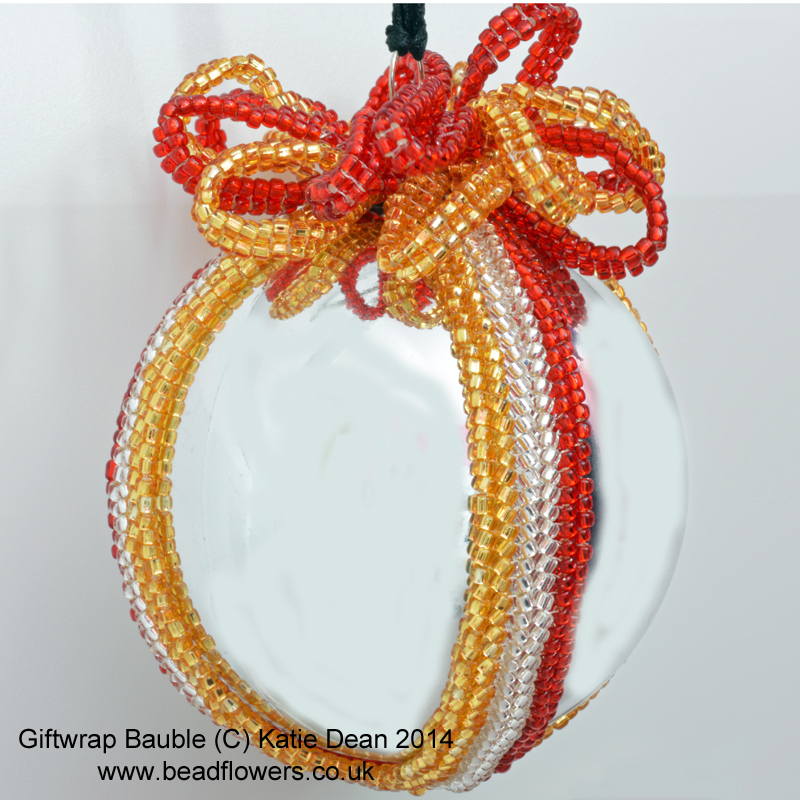 If you want to have a go at Herringbone stitch, then this bauble is a really good project to start with. 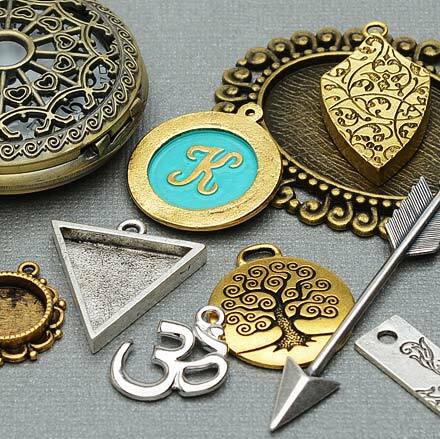 It is also possible to transfer seamlessly from herringbone into brick stitch or peyote stitch or Right Angle Weave, so you can create some interesting patterns and textures. 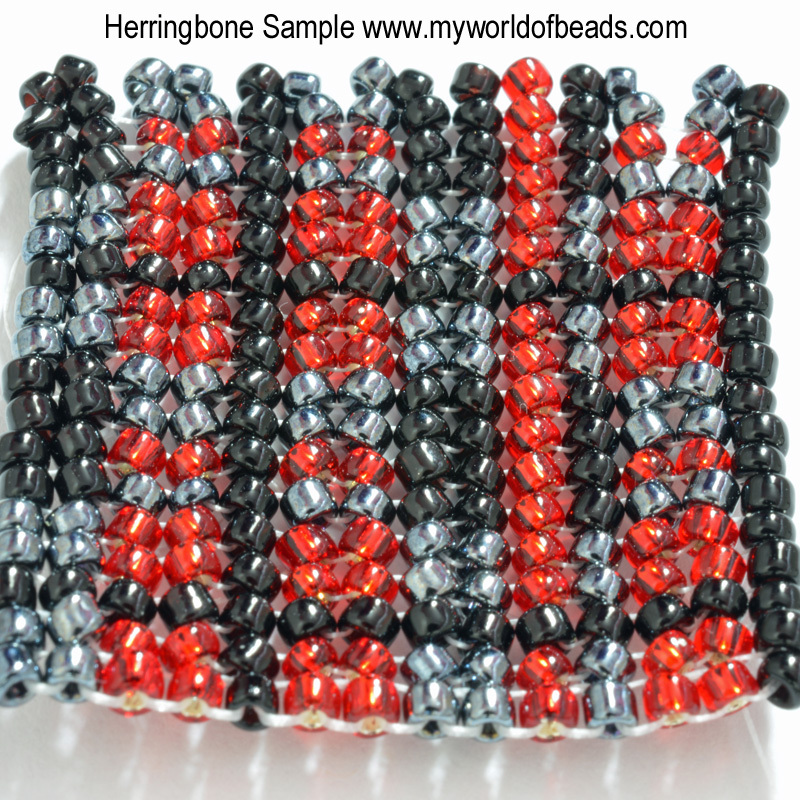 If you look closely at the sample above, you can see that, although the beads are sitting at slight angles to create the herringbone look, they are also sitting squarely on top of and beside one another. This means that you can in fact work a square stitch pattern in herringbone stitch – useful to know if you like to make beaded picture tiles. If you are already familiar with different bead-weaving techniques, then you won’t be surprised to learn that herringbone stitch can be shaped. It can be made in a tubular form by joining the ends of your first row to make a circle, then building the columns on top of this, all the time working around the circle. 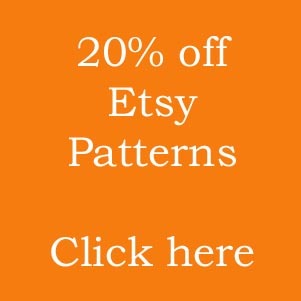 If this is something you would like to try, then this pattern is a great place to start. Once you have mastered the basic tube, you can add interesting spirals. 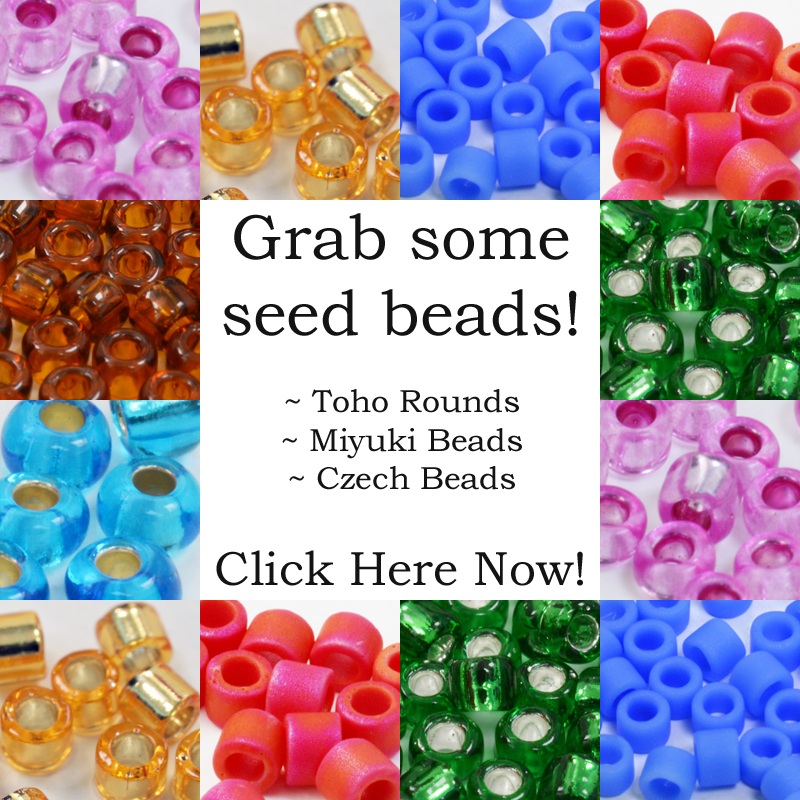 You can also use tubular herringbone with mixed sizes of beads to transform the tube into a curve. I used this technique to make this heart shaped charm. 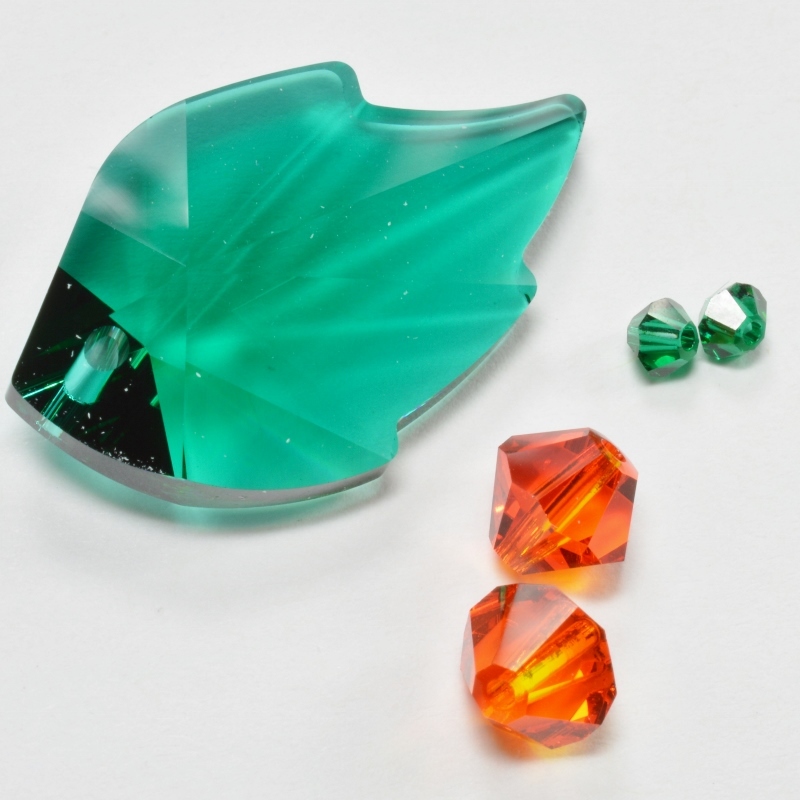 It is also a great technique for capturing Rivolis in beads to make Cabochons. The flat version of the stitch can also be shaped by increasing – this allows you to create curves and circles. It is also possible to decrease. The same increase and decrease structure can be applied to tubes so you can move from a straight tube to something with bumps in it, or you can use the technique to make bell shapes. 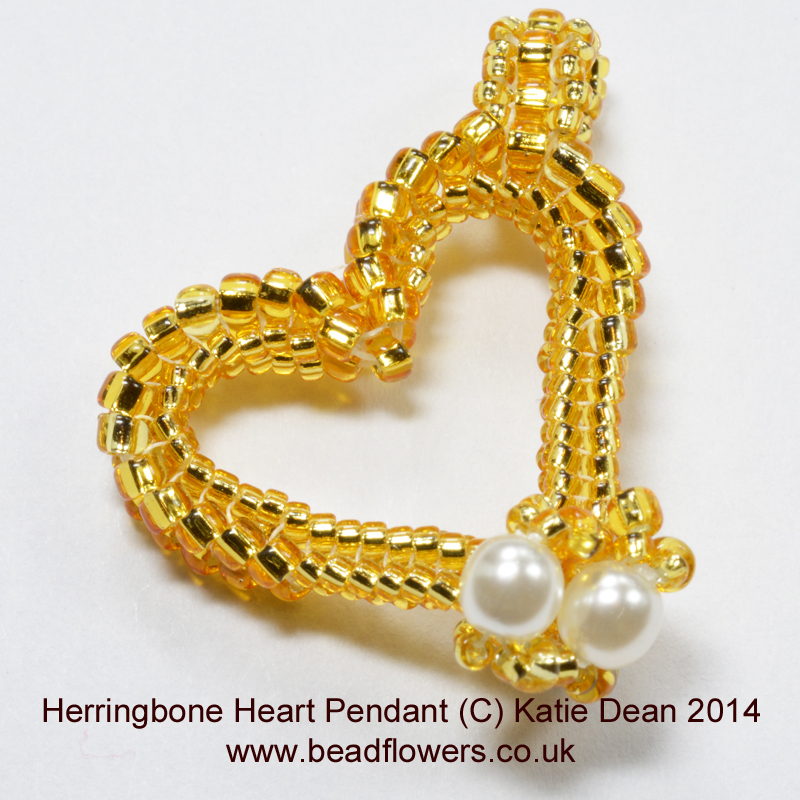 As with all the basic beading stitches, herringbone stitch has its own particular feel. It is a very flexible weave, so it can be a great option for making a structure that can be used rather like material. In its tubular form, this flexibility gives a very pliable tube, so it feel lovely to wear. 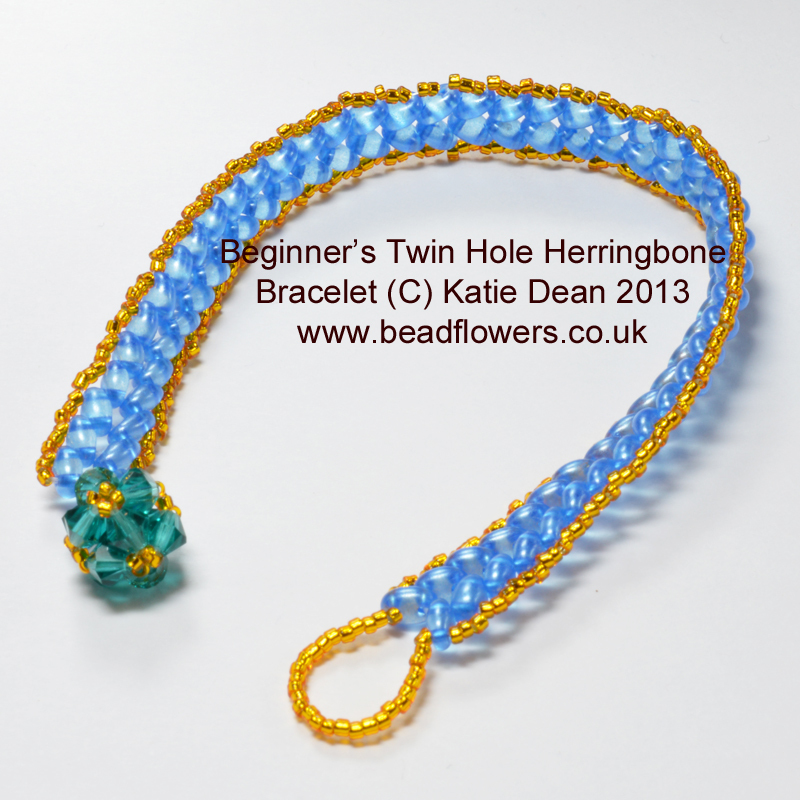 The twin hole beads also present some great possibilities for creating in herringbone stitch, so if this is something that appeals, you can find this beginner’s bracelet pattern here.